One year after leading a boycott against the MAP assessment test in Seattle public high schools, the teacher continues to fight for the kids. Jesse Hagopian, a middle-school teacher and son of former Seattle School Board member Amy Hagopian, hopes to stop plans to close Seattle schools by uniting parents in one big anti-closure group. Is 2013 the tipping point for high-stakes testing obsession? This article in the Seattle Post-Intellengencer featured Jesse Hagopian’s anti-war organizing at the height of the war in Iraq. Perfect Party: Here’s who we’d invite if we could entertain this month’s most interesting visitors, locals, and newsmakers. Why is the Garfield High history teacher leading a boycott against standardized testing? Perhaps to lock up the next decade’s worth of Teacher of the Year awards from a grateful student body. By John Young, Regular Contributor (Friday, March 1, 2013). 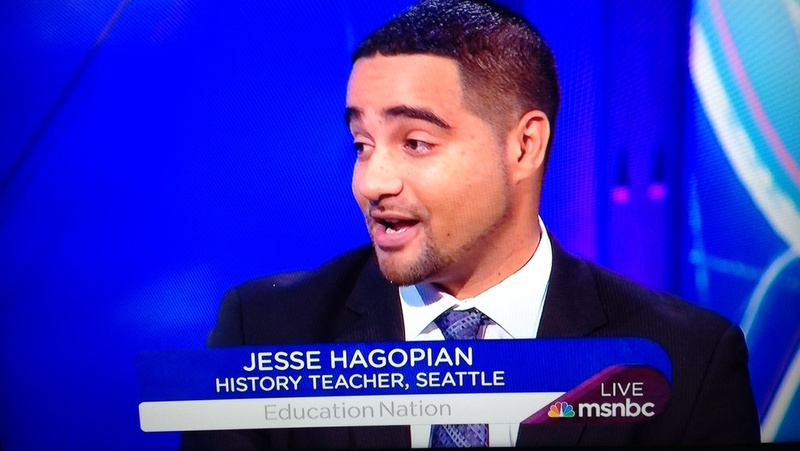 Jesse Hagopian is doing more than teaching history.